David Milne is best known for taking aim at the American president over his Aberdeenshire golf course. The vocal Menie resident has risen to prominence as one of the most outspoken critics of the neighbouring Trump International golf course since plans for it were tabled more than a decade ago. But he has now set aside his usually peaceful means of demonstration, and picked up some pistols instead, for his role in a new cowboy movie. Mr Milne will play the role of the Devil’s Parson in the upcoming film, entitled Attack on Tranquility. He described the character as a man who “seems determined to satisfy his lust for revenge, no matter how many people need to die in the process”. Although he is best known for appearing in documentaries, Mr Milne also has an interest in acting and has been an extra in several productions. The movie was filmed at the Tranquility Wild West Town, near Huntly, which offers the perfect backdrop for modern day Westerns. Tranquility founder, Alistair Baranowski, explained how the project had come together. He said: “We usually make films at least once a year, and put out an appeal for cameramen and crews to help us. “Early this year, we started work on this new one. “Mr Milne was one of the folk who came forward and asked to be one of the stars, and it just went from there. 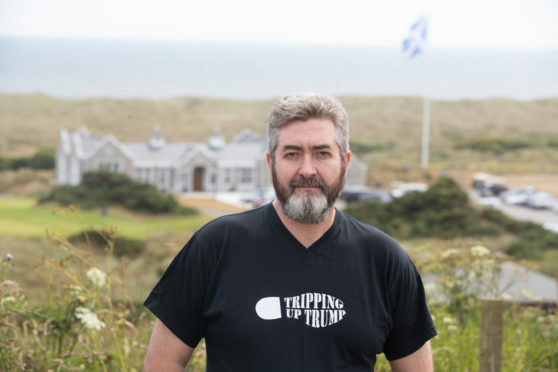 Mr Milne has protested against Donald Trump in many ways, and marked his inauguration as president by hoisting a Mexican flag from his house – which can be seen from the adjacent golf course. The film involved the work of about 30 people and was shot across four days. It will be premiered at the Belmont Filmhouse in Aberdeen at 10am on Sunday, May 5.